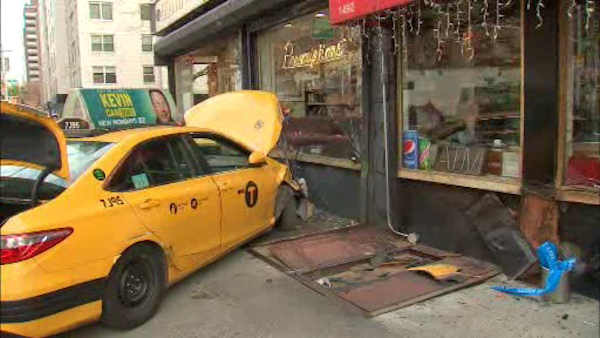 UPPER EAST SIDE, Manhattan (WABC) -- A yellow cab jumped the sidewalk on the Upper East Side Friday morning, leaving two people hospitalized. At about 9 a.m., authorities received a call of an automobile accident and found the taxi had brushed into a building at York Avenue and East 79th Street. Two people were treated for minor injuries at New York-Presbyterian Hospital/Weill Cornell Medical Center. The owner of a business there said one of his co-workers saw the cab coming and was able to avoid it enough to escape being seriously hurt. He said it was fortunate the accident happened on a day when many workers and students are off. "There was not many people like are usually here," said the business owner, Gustabo Mejia. "Usually by this time on a regular school day it's full of kids and people."